Empire Today - Empire Carpets - No Integrity, Poor Quality- Will not stand behind the Customer! 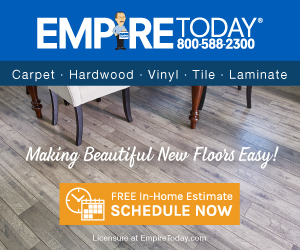 Thank you to PissedConsumer.com for helping me get the attention of Empire Carpets. I am very glad to report that in fact, they demonstrated integrity and customer service by re-evaluating their original decision and completley replacing my kitchen floor. I was extremley impressed with their level of customer service as well as their attention to detail as they did the work. Thank You again for your assistance in helping me resolve this issue. You go with a company like Empire because you believe they will stand behind their product and provide a high quality result – bad decision. We had our kitchen floor replaced with ceramic tile, the tile started to break in the middle of the floor, grout is coming up ALL over the floor in several places, the grout that is there is multi-colored (not one consistent color), the lines between the tile vary in size and are VERY noticeable, the threshold is made of such cheap wood that too has cracked. Here's the kicker - the floor was install in Dec 2007 – so the floor is BARELY over 2 years old. I called to have them replace the tiles.If you are a dissatisfied customer, they are VERY hard to get a hold of. We had someone out to "inspect" the work – they took ABSOLUTELY NO RESPONSIBILITY and informed us we are "past warranty" and the tiles we used are now discontinued.THAT WAS IT. I have had several other professionals out to provide me a quote on work in my kitchen they all told me that Empire is totally responsible and accountable for fixing the problem. Instead of taking my money–they told me to go back to the company to fix it. Empire's response was essentially: we do not support our customers, we don't care if you are satisfied, we use poor quality products and do not stand behind our employee's who do a poor job of installing our low quality product in your home, we do not care about quality or customer satisfaction.BUYER BEWARE! Review #199851 is a subjective opinion of EMLUNDI.